So I've been busy the last couple of weekends. 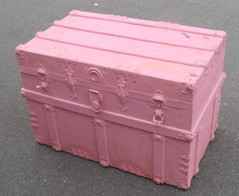 Do you remember waaaaay back when I found this trunk? Well, I finally did something with it. I thought it was adorable when it was pink, in fact that's what caught my eye to begin with. I really struggled with whether or not to keep it pink or make it a little more grown-up. I decided to go with the latter. I love the way the rivets look with the silver paint. This absolutely killer Heywood Wakefield-esque chair that started out like this, and then got a brand spanking new golden paint job. I love it. A bunch. It has a very similar feeling to the one shown below...right? 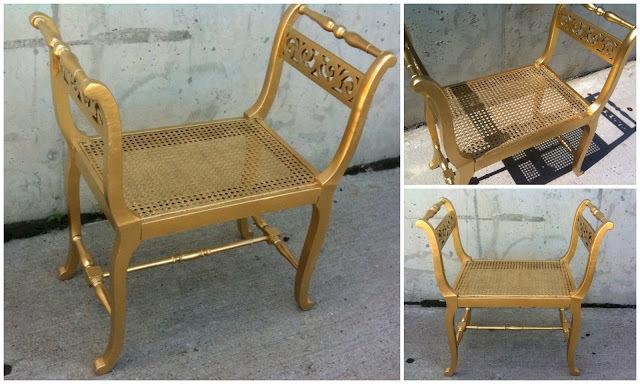 And then, here is a golden settee I have had for a while, and now have finally gotten it ready for the shop! Yep, this bad boy is for sale here. Whatcha think? You like? Just goes to show, that you can find absolutely amazing pieces on Craigs List, and at Flea Markets all the time. 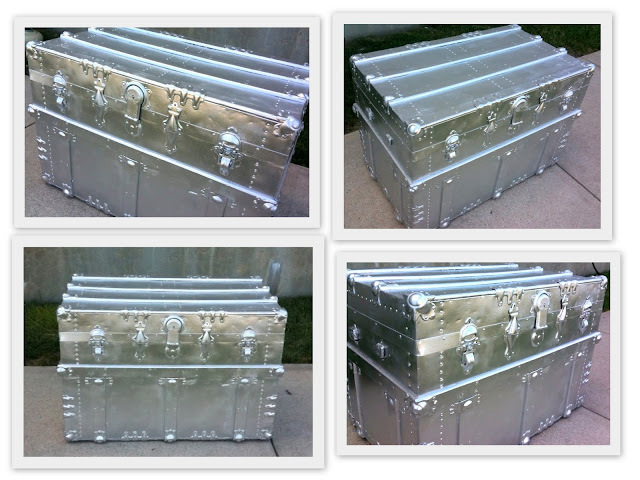 You don't have to have a ton of money, and buy from 1st Dibs to have amazing pieces in your home. You just have to see the potential when you come across similar pieces. love the gold pieces, especially that chair! great idea! Awwww great finds! They turned out stunning, that trunk is amazeballs! 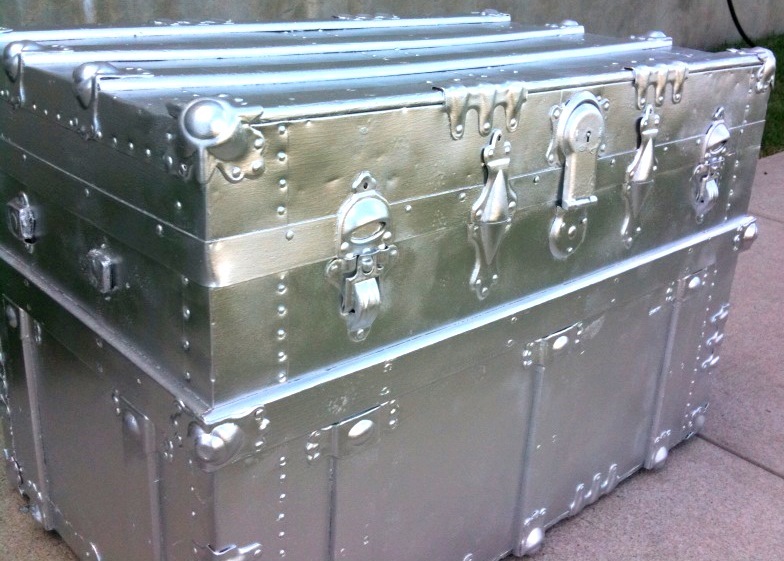 Your silver trunk is fab. I would have been nervous to change it from pink but you def. made the correct decision. 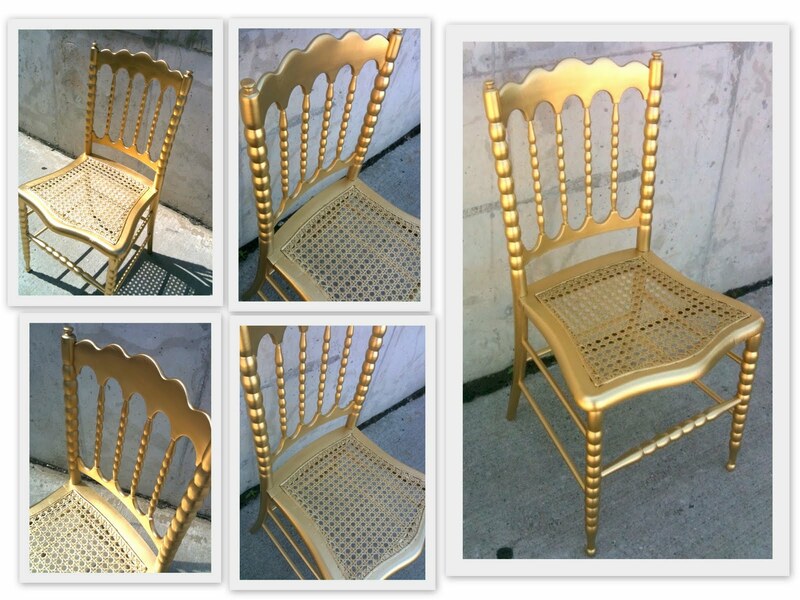 I also found a gold Heywood-esque chair and I love it! What kind of paint did you use? I love the gold chair. The paint I use is Rustoleum's Metallic. It's the only paint I've found that actually resembles metal. I have an old trunk that I may just have to paint! (Now that you've given me the idea and inspiration.) Love the gold pieces too. Great finds...and the gold finish is great, especially since it's sprayed! Really love the metallics! Especially the trunk.